International meeting advances Winrock efforts to bring international standard to U.S. producers. Posted on February 6, 2019 by Margaret Williams, Ph.D.
Siem Reap, Cambodia is home to Angkor Wat, one of the largest religious complexes in the world. The Angkor Wat temple complex and the 12th-century Angkor Thom royal city attract over two million tourists per year to the city in northwestern Cambodia. In late January, Siem Reap was also host to the Sustainable Rice Platform’s (SRP) 8th Plenary Meeting and General Assembly. 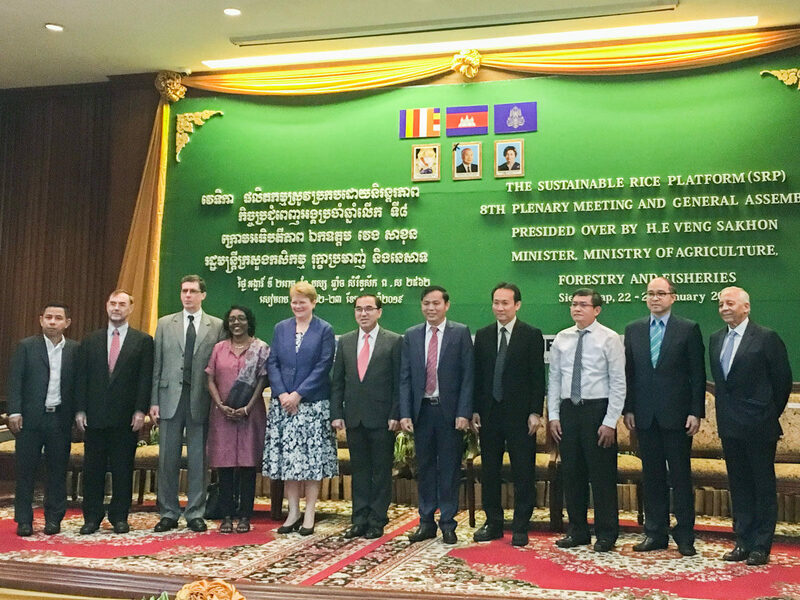 More than 140 high-level delegates from 24 countries around the world attended the meeting, which was presided over by His Excellency Veng Sakhon, Cambodia’s minister of agriculture, forestry and fisheries. Lauren Nichols and I, along with Winrock consultant Bob Zeigler, director emeritus of the International Rice Research Institute (IRRI), represented Winrock at the event, and I joined a panel called “Upscaling Impact through Innovative and Diverse Financing Mechanisms,” chaired by Mark Radke of U.N. Environment. 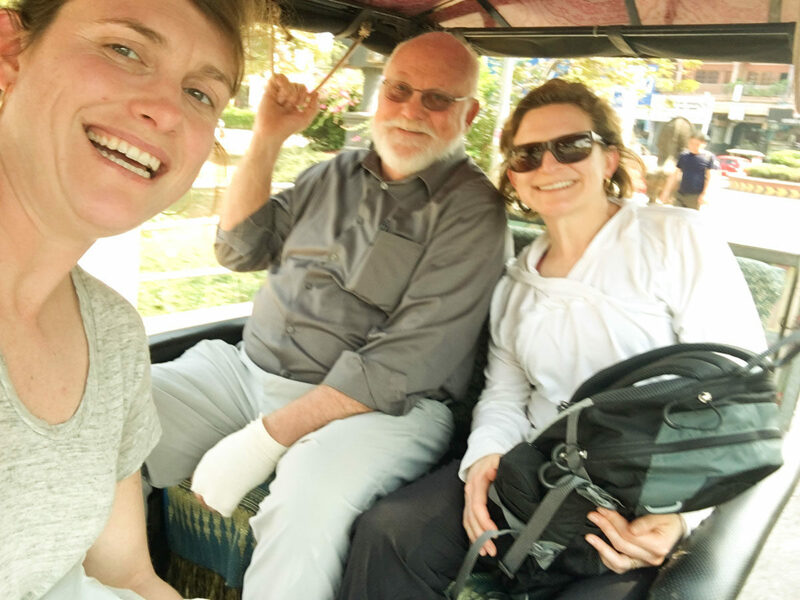 Lauren Nichols, Bob Zeigler and Margaret Williams in Cambodia. Rice is a daily staple for more than 3.5 billion people, accounting for 20 percent of the global population’s caloric intake. But rice farming produces methane, a potent greenhouse gas, and rice farmers are among the most vulnerable to climate change. Promoting sustainable rice production, then, is critical for global food security. To this end, IRRI and U.N. Environment co-convened the Sustainable Rice Platform (SRP) in December 2011 with the mission of reducing environmental impact and transforming the global rice sector by improving sustainable production practices and livelihoods. SRP’s vision is for one million rice farmers to adopt sustainable practices. The 8th Plenary Meeting marked significant progress toward advancing that goal, including an expansion of the SRP Board, the release of updated SRP Standard and Performance Indicators and a draft SRP Assurance Framework and Training Program. 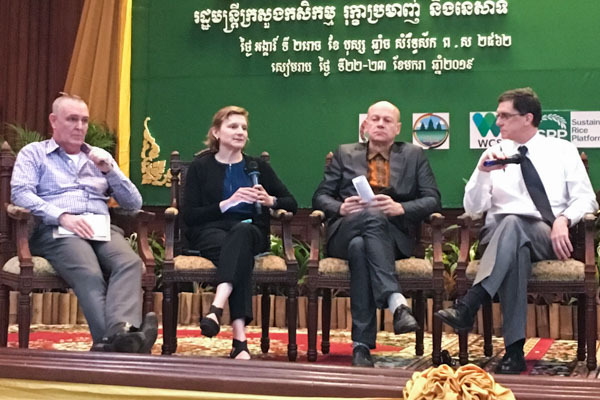 The conference included presentations on upscaling the SRP, financing, public-private partnerships, national stakeholder engagement, and the incorporation of internet communications technologies into the program. Incidentally, these are all areas where U.S. rice farmers and Winrock have experience and could share with the assembly! More than 140 high-level delegates from 24 countries around the world attended the Sustainable Rice Platform’s 8th Plenary Meeting and General Assembly. While the U.S. accounts for only 2 percent of global rice production, U.S. farmers are global leaders in sustainable production methods and adhere to strict environmental, health, safety and labor regulations. They work closely with university researchers and the USDA to innovate practices that reduce water use, greenhouse gas emissions, and fertilizer and energy use while enhancing wildlife habitat. In Cambodia and in many other rice producing countries, farmers are seeking access to information and support for implementing best practices. U.S. rice farmers are seeking recognition for their environmental stewardship. Both can be achieved through the SRP. With support from a 2016 USDA Natural Resource Conservation Service Conservation Innovation Grant and a grant from Entergy, the American Carbon Registry at Winrock International and project partners have been developing an independent, credible, rigorous sustainability certification standard for U.S. rice to respond to increasing demands from rice buyers to meet sustainable sourcing requirements as well as consumer demands for food safety. We identified the SRP as a good fit for the U.S. rice industry because it is science-based, focused specifically on rice, supported by a range of international rice buyers and NGOs and will allow for the comparison of the environmental performance of U.S. rice growers with rice growers from other regions globally. The SRP Standard was developed for smallholder growers in southeast Asia, but has evolved a process to approve SRP adaptations, called National Interpretations. Our team has collaborated with U.S. rice producers, the USA Rice Federation, and the SRP Secretariat and members to adapt the SRP Standard to reflect U.S. policy and regulatory frameworks, government incentive programs and local production situations. When the U.S.-SRP Standard is approved as a National Interpretation, it will allow full use of SRP claims and logos for U.S. producers that are certified to meet SRP requirements. Attending the SRP meeting helped us advance the progress of this adoption — and brought U.S. producers the recognition they deserve.